Mark Zuckerberg's current obsession is Facebook live video, and he invited astronauts to show off the feature Wednesday. 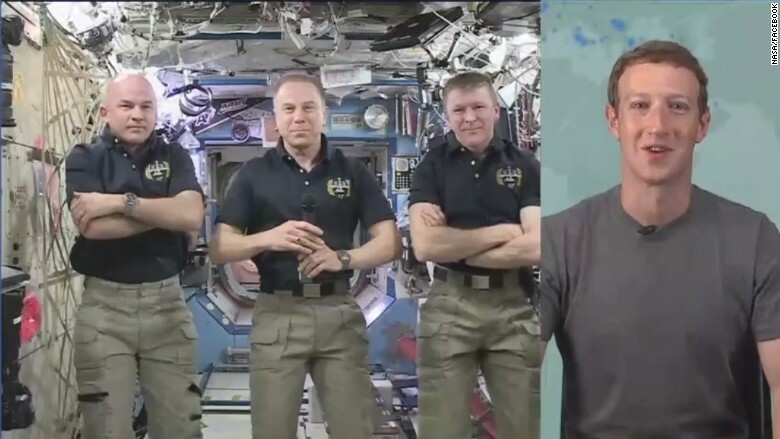 The Facebook CEO chatted with NASA astronauts Tim Kopra and Jeff Williams and the European Space Agency's Tim Peake -- who were aboard the International Space Station -- in a video conference call. The call was broadcast live on Facebook. "When you're building products to try to connect everyone in the world, connecting folks who are out in space is about as extreme and cool as it gets," Zuckerberg said. This isn't the first time that NASA has live-streamed to a social platform. But it is the first time that astronauts have used Facebook Live. In the past, NASA has used Google+ Hangouts and Skype to talk to people on earth. "All of these use the same video streams from space that are then plugged into these different tools here on the ground," a NASA spokesman told CNNMoney. During the roughly 20-minute Q&A, which was conducted by Zuckerberg, the astronauts talked about their mission and what they like to do for fun. "One of the main things that we do is try to understand the impacts of zero gravity on the human body," said Kopra, the commander of the ISS. "In large measure, we're an experiment." He referred to the need for constant exercise to mitigate loss of bone density and muscle mass, and monitoring the health of their eyes. As far as fun goes, Williams, a flight engineer, said it comes down to two things: playing with weightlessness and observing earth from space. "None of us get tired of viewing the earth from up here so we spend a lot of time in the window studying all the details of the earth," Williams said. "From time to time at the dinner table, we'll play with our food in unique ways so we all get to be kids again." At this point in the chat, all three astronauts did a somersault, which delighted Zuckerberg who broke out in a big chuckle. From left to right: NASA astronauts Jeff Williams and Tim Kopra, and ESA's Tim Peake. The live stream had more than 130,000 viewers at one point, which is exactly the type of mass audience that Facebook (FB, Tech30) is hoping to attract. In the past, Zuckerberg has boasted that Facebook Live videos can bring in more viewers than a typical TV news broadcast. Social platforms like Twitter (TWTR, Tech30) and YouTube have been trying to bulk up their live video capabilities as well. At the end of Wednesday's live stream, Zuckerberg asked the astronauts if they had a favorite piece of technology that they've been using in space. Whether it was a planted question or not, their answer couldn't have been more perfect. They said VR -- which is Zuckerberg's other big obsession.